There are three different subpart of Histiocytosis X Syndrome which include eosinophilic granuloma, Hand- Schuller- Christian and Letterer- Siwe . Histiocytosis X syndrome is associated with dendritic tumor cell. There are expressions of CD1a and HLA- DR.
Eosinophilic granuloma may involve lesion in the bone such as the spine, skull and mandible. Besides that lung may also be affected in this case. Eosinophil may present in the lesion. Eosinophilic granuloma may resolve spontaneously. Hand Schuller Christian may occur in children less than 5 years of age. It consists of diabetes insipidus, cystic bony skull lesions and exopthalmus. The treatment may involve curettage of the lesion of the bone and chemotherapy. Letterer - Siwe may be associated with young children lesser than 3 years old.Letterer- Siwe may present as fatal disease. 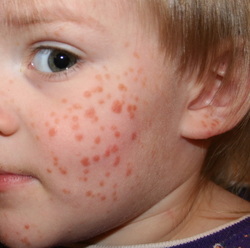 Patient may present with fever and maculopapular purpuric eczematous skin rash mostly in the scalp and trunk. Patient with Letterer - Siwe may also present with recurrent episodes of otitis media, pulmonary and bony involvement. Physical examination may reveal lymphadenopathy and hepatosplenomegaly. The treatment may include chemotherapy and corticosteroids. Generally Histiocytosis X syndrome may involve and affect organs such as bone, lung, skin and gastrointestinal organ. There will be neoplastic histiocytosis cell which look similar to epidermal Langerhan cell. Birbeck granules is detected inside the neoplastic cell. Birbeck granules present in the shape of tennis racket shaped cytoplasmic structure.